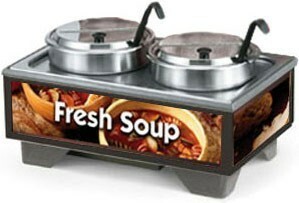 Showcase soups, stews, and other specialty dishes in style while keeping them hot and ready to serve with the Vollrath 720202003 Full Size Soup Merchandiser Base with 7 Qt. Accessory Pack and Country Kitchen Graphics. Easily visible even from afar, thanks to its bright colors and attractive country kitchen graphics, this product will enhance your presentation and catch your guests' attention. This item is easy to operate and equipped with a lighted on/off switch and recessed controls for precise temperature adjustment. Thanks to its low-water indicator light, your staff will not need to guess when they should refill the base since it will promptly notify when low. Easy to set up and convenient to use, this merchandiser base is perfect for any food service facility. This set comes complete with a 7 Qt. adapter plate, two 7 Qt. insets, two hinged covers, and two 3 oz. Kool Touch stainless steel ladles. Dimensions: 13-3/4" x 21-1/2" x 13-3/4"